fact of the world's brokenness. that keeps you from knowing even a fraction of what you see. hanging by the thread of itself. Bleating crickets. Rustle of dry stalks. it's a time to walk deep into the heart of what troubles you. predictions, messages the never arrived. Not my words, but in my heart nonetheless. the silence is another lock on the door. from this life but can only glimpse it. perfume of the earth burning, deep in the well of itself. We are the healed skin of its molten core. Photo is from the garden at the McNay Museum, San Antonio Texas. I remember the first time I saw a painting by Anselm Kiefer. We were in the Albright Knox museum in Buffalo NY and the ginormous painting was in a stairwell. We turned a corner and there it was. George headed up the stairs, somewhat oblivious I suppose, and was surprised, upon reaching the next floor, to find that I was no longer with him. I was rooted in place, awed and overwhelmed. In fact, George had to come back down the stairs and wait patiently while I took in that painting, even though as far as he was concerned it was just an enormous, and enormously ugly, painting. Museums trips were often like that with us. George would have to wait patiently while I slowly took in a single piece of art, and I would patiently traipse from room to room with George who always eager to see more and more, after I had already surpassed my absorption limit and was museumed-out. It was good for both of us. I still have that reaction every time I see a painting by Kiefer. They are immediately recognizable, and to me they have a palpable physical presence that extends far beyond their place on the wall. I am also aware that this feeling is not necessarily shared by all. Kiefer's paintings are not beautiful. If I had all the money in the world, I would still not want a Kiefer on my wall. They are, in fact, almost painful to see, drawing us deeply into the darker sides of human nature, to the stranger that exists in all of us. And yet, or perhaps because of this, they are extremely necessary. Art is not about pretty escapism, although it can be, art is about something far deeper, far more elemental. I would say art shows us the path to grace, but that path is not an easy path, and to get there we must also face the fact that we are not who we pretend to be. I went to SFMOMA while I was in San Francisco. I never intended to wander through the entire museum, just to stop into two or three galleries. I did not go in search of Kiefer, but upon arrival that is where I found myself, and in fact, it is where I spent most of my time. I did step outside of the moment long enough to take some photos, although my quick smart-phone photos do not do the works justice, hoping I might eventually pull my thoughts together. I am not writing about the works in the order I saw them, or even all of what I saw or thought on that day. It would be too much, even for me. As I walked into the gallery, this painting drew me toward it, although it was not the first painting I saw. Notice the Wagnerian theme, the twelve pillars of straw, like torches, burning yet unconsumed as they tower above a world in ruin, a culture consumed. It is significant that the pillars are made of straw, and that Kiefer has incorporated actual straw into the work. We like to think we are building for the future, that we are building of stone, and that the stone pillars we erect are built on a bedrock of truth and justice. But this is actually rarely the case. These are the stories we tell ourselves as we congratulate ourselves on the back, only to be shocked when the world burns around us and we see how ephemeral we and our beliefs really are. All of this filtered into my first impressions of the painting. And then I looked at the title, actually later, after walking around the gallery a bit. It reminded me also of the painting above (the name of which I did not write down). The portraits are all of great German thinkers: philosophers, writers, novelists. They symbolize the ideas on which German culture is founded, and prides itself. But they also all symbolize ideas that were taken and twisted into something outside their original intent to fuel the Nazi ideology. Kiefer's art specifically focuses on German culture, and the perversion of that culture under the Nazis. It is both historical but morally important, and it is relevant to far more than just Nazism. All of human history has its dark sides, all civilization, all religions even, can be and have been turned into something they were never meant to be, all in the name of good. Kiefer reminds us to be vigilant. I personally believe that people are good, that most of our lives are good, and I am pretty happy most of the time. But happiness is not a drug, and we must remember our darker selves. Only by acknowledging the darkness can we ensure that the light will continue. Looking at these paintings I am reminded that we all understand ourselves, and our world, our pasts and our futures based on our own experiences and understandings. History is filtered through the eyes of the historians. We need primary sources, but it is rare that we find sources from both sides of any human struggle. The story of history is often told by the victors, and it is written and rewritten time and time again. We must remember that it was always a choice, and that there always was, and always will be a might-have-been. Cling to the joy, the longing for cleanliness and purity and innocence, but do so with honesty and vigilance, lest the tide carry us away. Yet stronger and more buoyant. Stronger now than once I was. And I foud respite in the waves. 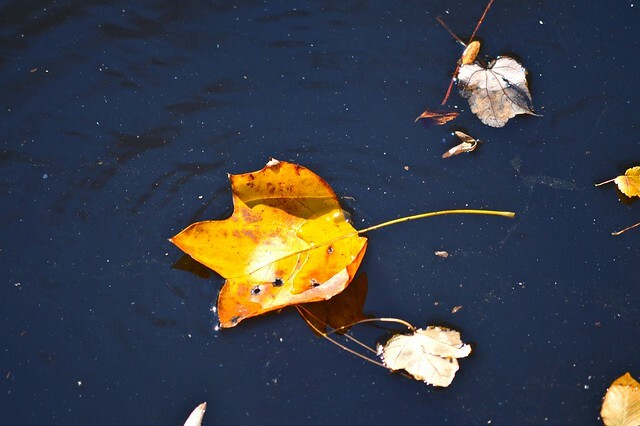 photo: "yellow leaf on water" by Laura Pontiggia on Flickr (here).